new innovative preventive and therapeutic strategies, and perhaps ultimately to a cure for atherosclerosis..
of a growing, dynamic plaque. destruction of tissue, leading to many diseases. is the lack of an appropriate animal model, which is something the project has addressed. may play a role in the development of atherosclerosis. National Institute of Scientific and Medical Research (INSERM), in Bordeaux, France. Pharmacy at the University of Bordeaux. This discovery appears in FASEB Journal and is published in June 2016. Merched A, Daret D, Li L, Franzl N, Sauvage-Merched M.
muscle cells are stained in green, nuclei in blue. or stroke. Every year, CVD causes over millions of deaths worldwide. 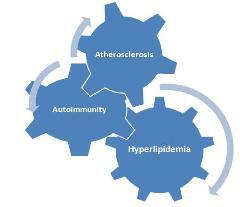 inflammatory diseases which display symptoms of atherosclerosis. approaches, which could ultimately bring a cure for atherosclerosis and help save millions of lives. How the lesions build up?